An attractive stone archway leads from the patio into the Lounge/Dining Room where a log burning stove blazes, welcoming guests. 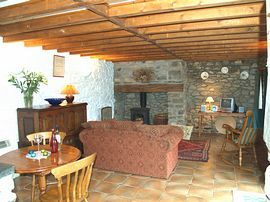 The room is furnished with comfortable sofa, rocking chair, colour television, CD player, pine dining table and chairs and items of occasional furniture. 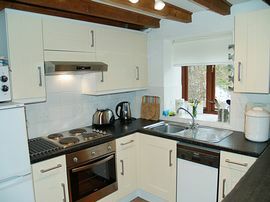 The Kitchen is fully fitted and containing electric cooker, fridge/freezer, dishwasher and microwave oven. There is an automatic washer/dryer in the cupboard upstairs. 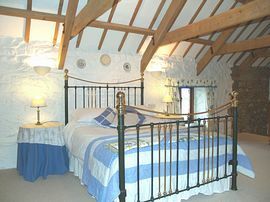 The Gallery Bedroom is very spacious and attractively furnished, beamed ceilings, pretty soft furnishings and a splendid king-sized Victorian brass bedstead all adding to the character and romantic atmosphere of the room. There is a z bed for occasional use by a child. Bed linen is provided for the bed, which has a duvet. 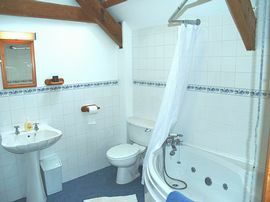 The En-suite Bathroom is well equipped with Jacuzzi bath, hand held shower over bath, wash hand basin and WC. A cot and highchair are available. There are night storage heaters and electric heaters throughout and electricity will be charge accordingly. King Size Victorian Brass Bedstead. Within minutes of Pembrokeshire Coastal Path. 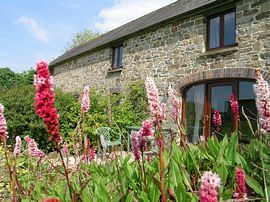 There is a sunny patio and lawned garden, barbecue and garden furniture are provided. Ample parking.